I did think about, quite literally splattering the little squares across the quilt top, much like my little one did across the dining room table. Then I sat down to sketch. And my girls sat down with me. Instead of family portraits The Monster asked if she could sketch quilts too. Together, her and I came up with this design. In the interest of the challenge I used the Kona white I had, added a few other scraps (in solids only), and used a batting scrap. It's a poly blend batting, not my favourite, but it was what I had around in the right size. Because I like to be different I did the quilting in turquoise, not white. Goes well with the binding, doesn't it? Soon enough it will become a little playmat for the neighbour's brand new baby. If it doesn't get stolen by a certain baby loving child of mine. This quilt reminds me of the theme song for 'Weeds'! Have you heard it... little boxes on a hill side little boxes amde of ticky-tacky! Not sure why but that just poped into my head! Very cool design, Cheryl! 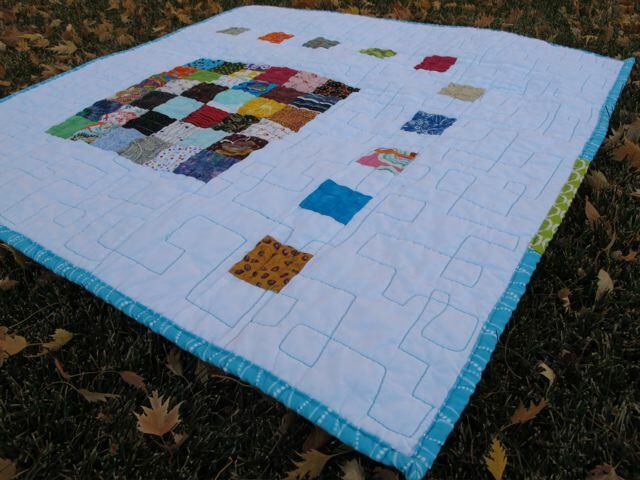 And great quilting! It's so interesting to see what different people will do with the same challenge parameters. Mine looks completely different from yours. Very cute - I think there's another quilt designer in your house! Great name for this quilt. I really like the design! I love it and how fun to be able to involve your daughter. it looks fantastic. i'm glad you put the sizes on the post. it looks like it could come in at 15" x 15" if you didn't know better. that would make those scraps pretty darn small. 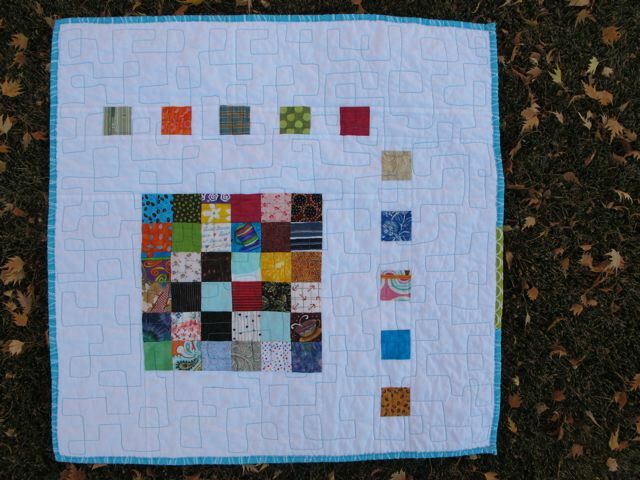 love your creative layout and your awesome quilting. (in gorgeously colored thread!) it's good all around.